The Marantz Professional PMD-706 is a six-channel recorder designed for professionals working with DSLR cameras. 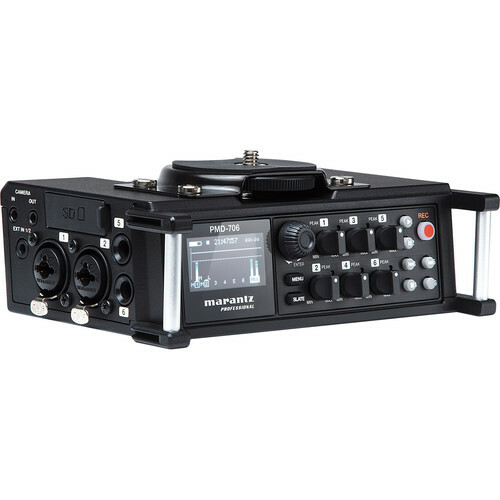 Recording audio at sample rates and resolutions up to 96 kHz/24-bit, it’s designed to attach to a camera, a camera rig, or to double as a dedicated, unattached field recorder. The device accepts SD, SDHC, and SDXC cards, housing up to 128GB of recorded audio. Its battery lasts approximately 5.5 hours in the field (with phantom power off). Marantz Professional’s high-definition, discrete microphone preamps are provided, as are four combination XLR-1/4” input jacks that can handle mic- and line-level sources—with or without phantom power. Two 1/4" TRS jacks are also supplied, in addition to a 3.5mm TRS input that further expands its functionality. A dual-recording function allows you to record two tracks, one at a hotter level, and the other at a reduced level; in this manner, you can safeguard against accidental clipping, such as when a person in the shot starts yelling without warning, or for no reason whatsoever. You can utilize this dual-recording feature to create a total of three safety tracks. Included with the PMD-706 are breakout cables for converting 1/4" to balanced female XLR connections; these can be used with the unit’s TRS jacks. Box Dimensions (LxWxH) 10.2 x 8.6 x 3.0"
6-Channel DSLR Recorder with up to 96 kHz/24-Bit Resolution is rated 4.0 out of 5 by 1. Rated 4 out of 5 by Roger from Lots of features for the price - and a big glitch I use this machine for recording music in the field. First impressions - nice feature set, good in/out options, adequate build quality, easy to power, preamps sound good. Now for the bad news - if you lose power (in my case the USB connection for the external battery came loose and it drained the AAs I had in for a backup) the file in progress will vanish. No recoverable data on the card. No file with a 0byte incomplete header like just about every other recorder on the market. Nothing. I contacted Marantz Professional support after my incident in hopes to recover the 1h:20m of the concert I had been recording and was told quote - "that's the way it works - lose power lose files". Tested at home under same conditions and same results. No files. Hopefully this can be fixed with a firmware update. Otherwise make sure you have a good fit for the USB cable for your external battery (I was using the supplied cable but not anymore) and fresh AAs in addition to checking the battery icon (it will show which power source - USB disconnect automatically defaults to internal batteries) to ensure you have plenty of power. Can you monitor each input channel separately? Yes, you can monitor each channel separately. In the internal menu, you are able to assign the monitor output to an individual channel or stereo group, M/S channel, or the mix. If you use Cloud Lifter will there be enough gain to send from Shure SM7B to Marantz without excessive gain necessary on Marantz end? The Cloud Lifter will utilize the phantom power on the Marantz recorder to increase the gain output of the Shure SM7B mic and send an appropriate audio level back to the recorder. You should then have good headroom on the Marantz for adjusting gain. When is this product going to be available? It's been in pre-order status for a very long time. Currently, the Marantz PMD-706 is expected to arrive end of October 2017. When trackinng multiple inputs, will they be hard panned L/R in the monitoring or can i Center Pan each input? They will default to Center Pan. If ext in 1/2 is plugged in, will the system capture off in 1 and 2, or are they electrically removed? Example, if iPod is connected to ext in playing pass thru, can a mic be recorded on 1 or 2 in? When using the external input 1/2, you would not be able to utilize the first two XLR/TRS channels. You would connect your microphones into channels 3 and 4. What is the latency between microphone and headphones monitoring Marantz output? No latency issues have been reported. I had not noticed any latency issues while auditioning this item. Does the gain knob operate as digital gain (like Tascams do) or analog? Hi! Happy to help! The gain knobs are analog, not digital. What is the noise floor like on the Marantz PMD-706. If you turn the gain up to 64db (the high+ setting), do the preamps get terribly hissy? How far do you have to turn down the gain to get usable results? Will B&amp;H be doing a video review of this new product? The Marantz PMD-706 mic pre-amps have a signal to noise ratio of 88-90db. I would recommend you not use this recorder with microphones that require the full 64db of gain. It is at the highest point that you always hear some hiss. A B&amp;H product review is not out of the question, and maybe in the works, but I do not have a timeline for that at this time. FYI, Customers that I have spoken to tell me the gain structure is good enough for pro-sumer (non-broadcast) applications. My take; the PMD-706 is a good price-performance audio recorder.